The approval of the Blueprint container specification by the OSGI Alliance Enterprise Expert Group (EEG) inspired members of the EEG to start an open source project centered around implementing the Blueprint spec and other technologies for OSGi applications. In September the Apache Aries project was born in the Apache incubator. The purpose of the Apache Aries incubator is to create a new community of people interested in building enterprise OSGi technology geared toward the application programming model. For an introduction to the history and the purpose of the Aries project, DZone interviewed Ian Robinson, a Distinguished WebSphere Engineer and a member of the OSGi EEG. Robinson is at the frontrunner for the Apache Aries project and has begun using its technology for IBM's WebSphere Application Server. DZone asked Robinson about the factors inspired the Aries project. Robinson said, "From a standards direction, the work of the OSGi Alliance EEG was to define a set of specifications that would form part of an enterprise profile for OSGi." He says the EEG has approved several specs for technologies that allow OSGi applications to consume existing Java EE technologies like JTA, JPA, JNDI, etc. 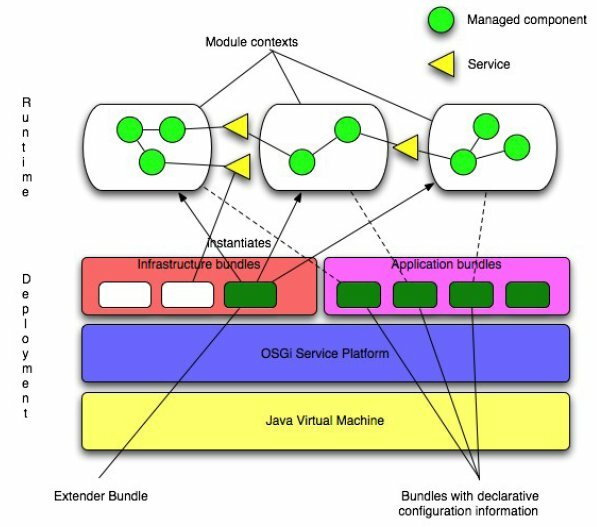 "The purpose of the EEG was not to try and define competing specifications but to take what exists already in the Java enterprise space and define how those technologies become consumable for applications running in an OSGi framework," Robinson said. Robinson also observed some point efforts starting up inside existing Apache projects that didn't have an enterprise OSGi home to host them. One example was an implementation of the Blueprint container spec, which started out inside Apache Geronimo, an open source Java EE application server. Robinson said that developing a Blueprint implementation in Geronimo made sense since the app server could use the it, but that didn't provide much visibility of the Blueprint work outside of the Geronimo project. Robinson and his collaborators thought it would be a better idea to start a new incubator project who's primary focus was enterprise OSGi, form a community around it, and then gather a set of OSGi technologies in that new project so that other projects like Geronimo, Felix Karaf, and ServiceMix could use that technology in their own runtime environments. Apache Aries is not an effort to build a new enterprise application server or a new application integration runtime. Robinson says the purpose of the project is to build components like the Blueprint container that can be used by those enterprise application servers. Apache Geronimo is currently working on consuming the Aries Blueprint container and Apache Felix Karaf, which is the kernel of an enterprise integration runtime, is already consuming the Aries Blueprint container. In its three month existence, the Apache Aries incubator has already been successful in building a sizable community. Including Robinson, there are currently 43 committers distributed across a wide variety of companies. Robinson says at the end of an incubation period, an incubator is considered a success and a top level project if it builds a vibrant community, and Aries is well on its way with companies like Red Hat, Progress, IBM, and SAP represented. Right now, no timeframe has been determined for when the Aries project intends to graduate from incubation. Robinson says the community will decide when they've done enough work to become a top level project. DZone asked Robinson the most important question for any Apache project: 'How did the project get its name?' Robinson explains: "We started thinking in IBM about the Aries project way back in early April when the Blueprint work started in Apache Geronimo. I mentioned that Geronimo is a consumer of Blueprint, but not the obvious project to develop it - we thought back then that what we needed was a new incubator for the Blueprint container and other enterprise OSGi technologies. Aries is the star sign for that time of the year - simple as that." Hence the logo for Apache Aries is the ram. IBM's WebSphere Application Server v7 already uses some of the technology in the Apache Aries project for its Open Alpha, which helps deploy enterprise applications as OSGi bundles. To get involved with the Apache Aries project, you can visit their "Getting Inolved" page.